A new Tron movie means new Tron merchandise, but some of the stuff Disney's announced looks pretty cool. The jury's still out on whether the action figure is either super cool or just plain creepy, though. Disney certainly seems to believe in Tron: Legacy, based on the early promotional materials that have been released. The film and its tie-in game, Tron: Evolution are going to be heavily featured at next month's Comic-Con, where Disney has promised to unveil much more information about the upcoming movie. 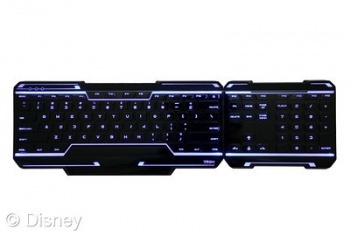 However, the company has also revealed a ton of themed peripherals for the film, several of which look pretty solid. Disney has revealed a surprisingly large lineup of Tron toys and accessories that are going to start shipping to stores this October. Surprisingly, several of these products are not crappy action figures or the pieces of kitsch that we're used to seeing alongside most Disney films, which is something the company seems to be banking on when it comes to appealing to a wide array of fans. "Featuring dark finishes, neon lighting and a cyber aesthetic," said Disney in an announcement this morning, "DCP's new Tron: Legacy line will immerse kids and adults alike into the amazing, illuminated cyber world of Tron." Adults are definitely the target audience for some of the peripherals. Aside from the Razer mouse ($99) and keyboard ($129) — which features the ability to switch the number pad to either the left or right side of the device — Monster and DCP teamed up to create some high-end headphones and an iPod speaker dock. The headphones sound particularly useful, as they're noise-canceling and will provide users with a hands-free calling mode, but $350 is going to be out of a lot of peoples' price range. 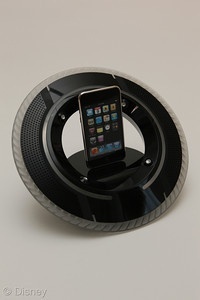 The dock, meanwhile, is shaped to look like a Tron disc, which is cool, but it's the sound quality that is going to need to be awesome to justify the $250 price tag. 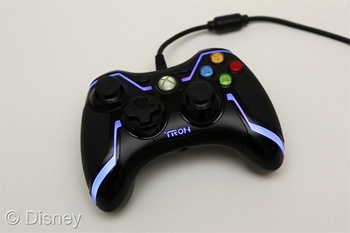 Older fans will also want to check out the the Tron-themed game controllers for the Xbox 360 and Wii consoles, which will sell for $50 each. It's also been revealed that Burton is working on a set of snowboarding boots with the Tron motif included in the design, which has a suggested price of $270. Actually, even the action figures sound pretty cool. The figures will come in a couple of different sizes and will feature the ability to project, "digitized, illuminated and moving faces onto the helmet just as in the film." There are also going to be light-cycle replicas available for separate purchase so you can place the figures inside and stage your own battles/races. Prices will range from $15-40, depending on the figures' size. Comic-Con is July 22-25, where Disney has promised it will have a booth full of Tron merchandise on display for fans to check out and play with. Some of the above products sound surprisingly cool, but I can't help but wonder why no one thought of teaming up with Nerf to create a battle disc set.